Italiensk Kulturforening i Stavanger - Filmkveld "La mafia uccide solo d'estate"
Filmkveld "La mafia uccide solo d'estate"
With this movie we start a series of filmkveld following a specific theme. This years we will present movies by young directors that describe the modern and old italian history through a fresh point of view. 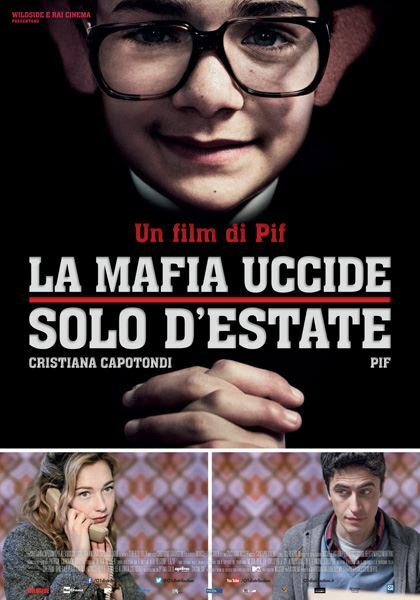 The Mafia Kills Only in Summer (Italian : La mafia uccide solo d'estate) is a 2013 Italian comedy-drama film. It marked the directorial debut of the TV satirist PIF. The Italian Senate President and former anti-mafia magistrate Pietro Grasso referred to this film as the best film work on Sicilian Mafia ever made. It was awarded best comedy film at the 27th European Film Awards. The story takes place in Palermo and it follows the story of the young Arturo Giammarresi, who wishes to become a journalist and has loved Flora since he was ten years old. His awkward attempts to conquer her heart run parallel to his (and his city's) slow realisation of the existence of Cosa Nostra- In the end, the movie is mostly a homage paid to the policemen and the magistrates who fought and gave their lives between the late 1970s and 1992, heroes of legality that were martyred in the attempt to dismantle the Sicilian Mafia.